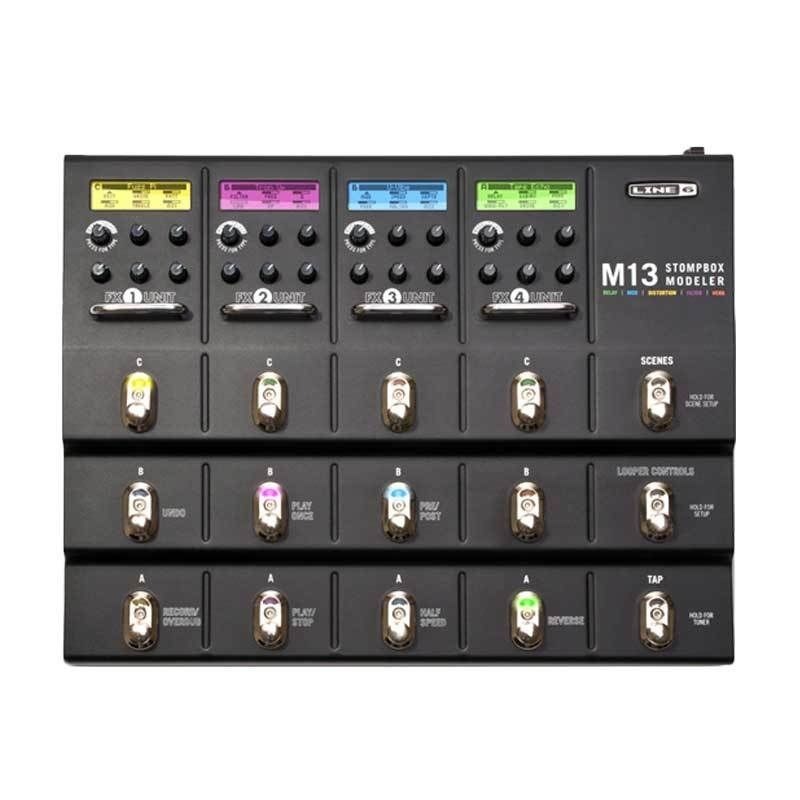 The Line 6 M13 Stompbox Modeler has the soul of a multi effect pedal and the power of a rack. It boasts a complete collection of the immortal stompbox effects, stompbox simplicity, rock-solid construction, and much more. Teeming with over 100 immortal distortions, reverbs, delays, and more, the Line 6 M13 pedal offers instant access to an arsenal of history's most celebrated stompbox sounds. Get 19 celebrated analog and digital delays, 18 distinctive distortions from creamy to crazy, 12 reverbs from modern (particle verb) to vintage (spring reverb) to ancient (cave reverb), 26 vibey filters including wahs and pitch effects, 22 tangy mods including expressive trems and phasers, and 12 compressors and EQs that squash, gate and color. The Line 6 pedal lets you use up to four models simultaneously, in any order and in any combination. It's like having a gigantic pedal board (without all the tangled cords and overloaded power strips) stuffed into a convenient, easy-to-use package. Included are all the models from best-selling Line 6 pedals and rack gear DL4 Delay Modeler, DM4 Distortion Modeler, FM4 Filter Modeler, MM4 Modulation Modeler, Verbzilla, Echo Pro and others. The Line 6 M13 Stompbox Modeler is easy to use, just like a classic stompbox. Tweak your tones on the fly using the dedicated knobs. No menus, no saving, no hassles-just turn the knobs and you're done. And your settings remain when you power down! Four bright LCD screens show parameter names and values, and the built-in chromatic tuner. The 28-second looper is always at the ready with dedicated footswitches for Play/Stop, Undo/Redo, Rec/Overdub, Half Speed, Reverse, Play Once, and Pre/Post. You're free to adjust your sounds while looping or overdubbing. M13 Stompbox Modeler plays well with others. Take advantage of the stereo FX loop and put your other effect pedals in front, behind or even in between M13 Stompbox Modeler's models. 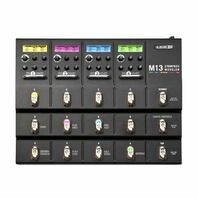 Prepared for any live or studio situation, Line 6 M13 guitar pedal features mono/stereo inputs and outputs (with True Analog bypass or DSP bypass), mono/stereo assignable FX sends and returns, MIDI input and output and two expression pedal inputs. Built tank-tough with all-metal construction, Line 6 M13 multi effects pedal is designed to survive on-stage abuse. From the chassis to the footswitches, it'll withstand constant stomping. M13 Stompbox Modeler's treasured stompbox tones, built-in chromatic tuner, 28-second looper and bonehead simplicity will prove totally indispensable (not to mention highly addictive). Check the Line 6 website for software updates that increase the power of your Line 6 M9 Stompbox Modeler! Create up to 48 "scenes"